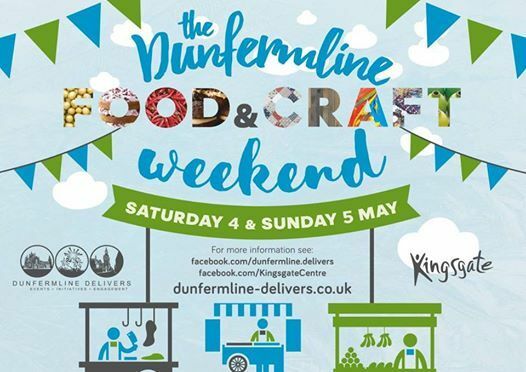 Dunfermline Delivers and the Kingsgate Shopping Centre are happy to announce that the Dunfermline Food and Craft weekend will return on 4th & 5th May! This year the event is shaping up to be even bigger and better with over 50 stalls, covering an exciting range of street food such as hog roast, Middle Eastern vegan-influenced food, fish and frites and homemade pies. For the first time, there will be stalls and buskers at the Glen Gates on both days. On Saturday the 4th of May, Kingdom FM will be hosting live music at their roadshow in the High Street, located at the gap site in front of the bus station. Performers include Conall Adam, The Biernagels, Deni Smith, David Stevens and Sophie de Rose. 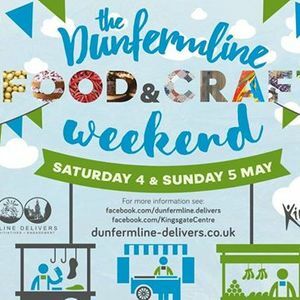 Chris Foote, Events Manager at Dunfermline Delivers said, “We’d like to thank our BID businesses who are once again bringing lots of enthusiasm and ideas to help to make this a great weekend. Over 10 venues are participating and a new addition this year includes a tasting event by Turkish restaurant, Antioch. Hot doughnuts, waffles, cupcakes, clootie dumplings from Clootie McTootie and artisan bread will also be on sale. If all of that works up a thirst, then visitors could sample or buy locally brewed beers, Lundin Gin, Scottish rums, Scottish wines, apple juices and home-made ginger beers. May the 4th be with you, as Aileen Wright from Sew Yarn Crafty will be helping visitors to sew a Storm Trooper and Carnegie Birthplace Museum will be welcoming families to their Dinosaur Egg Crafts event. There’s lots more to keep the kids entertained including balloon modelling, facepainting, foodie craft fun with Doodle & Splat and the colouring wall with local artist, Alan Grieve Fire Station Creative will be hosting a studio in the Kingsgate. Street performances by Carnegie Youth Theatre will pop up around town. Dances from around the world will be staged by local group, On Pointe Performing Arts in the Kingsgate Shopping Centre.